British yes, Oasis no. Thank God for that one. I don't know about you, but I am getting really sick of the wannabe Beatles sound coming from Britain these days. Luckily, this band is not so quick to follow in the tracks of others. Their original sound, paired with their rich lyrics makes Plastiscene one of the bands to watch out for in '98. 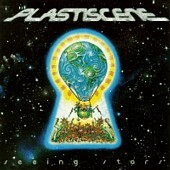 Seeing Stars is the first full-length album from Plastiscene - they previously released a self-titled EP in 1997 which received quite a bit of play on college radio stations. Their sound is a mix of acoustic guitars, distorted electric guitar, keyboards, organ, and trippy vocals. The band mixes all of these instruments to make a fairly original sound. Other critics have described their sound as a mix of Radiohead and the Smashing Pumpkins, however I tend to disagree. To me, Plastiscene is more a mix of 60's era psychedelica and 90's rock - almost a blend of Space Monkeys and Kula Shaker. The songs on the album vary in styles. Songs such as the opener "Sundial" showcase the band's talent for mixing all their influences into one luscious sound. It has all the makings of great music, with the delicious vocals, catchy guitar riffs, and the organs and keyboards to give it that personal touch. Others such as "Lemon Yellow" (which was featured on the BASEketball soundtrack) delve into the past while holding a firm grip on the present, all to make up what is a possible musical future. The use of the Hammond B-3 is quite pronounced, and it gives the album an undergound, laid back groove feel. Plastiscene is not only about the psychedelic rock style though. Other songs such as "Big Wheel" venture into the lighter, slower pop sound. The only complaint I have about this song is in the opening riff - it sounds strangely familiar, they didn't rip it off from the Smashing Pumpkin's "Today" (Siamese Dream), did they? If you are a fan of Brit-Pop, check out the band. If you are a fan of the psychedelic 60's sound, check out the CD too. What is that? You like the 90s alternative sound? Well, then check out the CD. Hell, just check it out if you know how to turn on your CD player and put in a disc. The worst that can happen is that you won't like it - and if that is the case, I know plenty of people who would love to take it off of your hands. (Hey, Tommy even liked it, and he is the big rap man around here).